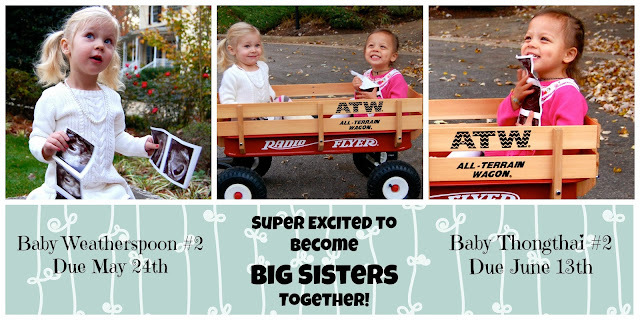 A Big Surprise and Thanksgiving Week! I'm going to come clean with y'all right now– cooking and posting about it for the past 2 months has been ridiculously hard. The only thing that kept me doing it was knowing there were people out there who do read this blog and many of you rely on the recipes. Why has it been so hard? Well this cute little picture below should give you a hint! The other baby mentioned is my soon-to-be niece or nephew. As if these two cuties at once weren't good enough– we get to do it all over again! Thinking up new recipes, shopping for them and cooking them are really not things you want to do with morning sickness. Every mention of food had my stomach turning. However, I'm pretty sure Wor and Lily are grateful that I plowed ahead and kept cooking. I'm coming out of the morning sickness with a ravenous appetite. That means there are some great recipes coming your way! For the rest of this week I will be talking about Thanksgiving! I don't have a whole meals worth of recipes to share with you but I will be giving you an awesome arsenal of sides, a great roll recipe and the best darn coconut cream pie recipe you will ever find. What are the essential dishes at your Thanksgiving dinner? I'd love to hear about them! Wow! Congrats! That's very exciting news! I was kinda wondering if something was up, based on your comments. Hope you're feeling ok now and looking forward to updates.